We explore the question “is wood-tar creosote” bad for your BBQ food? There are lots of stories out there in the BBQ world about creosote! Most have the same tone: creosote is not something you want when you cook with wood. Unfortunately, that can never happen as creosote is always present in wood. 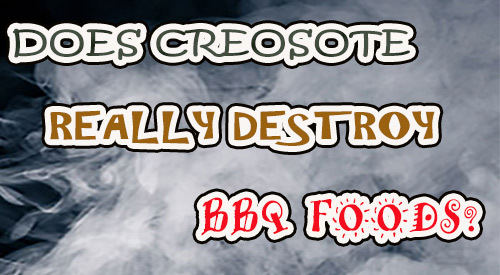 So, why has creosote become the monster of BBQ cooking? Likely because there is confusion with another type of creosote: coal-tar creosote, commonly used to preserve such things as railroad ties, telephone poles, bridges, etc. You know when material has been exposed to coal-tar by the black, charred appearance. One of the primary advantages to having creosote in hardwood is its ability to act as a preservative. Long before equipment was designed for cooking, people would dig holes in the ground to produce a smokehouse for preserving game meats they hunted. It was the only method of ensuring safe consumption when refrigeration wasn’t readily available. Wood-tar creosote is colorless to yellowish and presents as a grease or oil consistency. It is a combination of natural phenols which are the natural compounds that produce the flavors of BBQ when the wood is combusted or burned. In addition to the distinct flavor, phenols are also responsible for the aroma and color of BBQ foods. Guaiacol is a compound derived from methyl ether and is responsible for BBQ’s smoky taste while the dimethyl ether syringol is the chemical responsible for BBQ’s smoky aroma. Now that you know not all of creosote’s chemical composition is bad, what are the risks to a wood-tar creosote? The biggest risk is in burning wood that is not at an ideal combustion rate. I’m sure you’ve had experience with campfires that produce an acrid aroma and literally cause a foul “taste” in the air from poor combustion rate (too slow burning). That is the challenge and risk when using wood products with food for hot smoking. 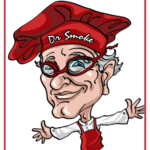 Remember, hot smoking requires temperatures that are lower – generally below 275°F. To achieve a consistent low temperature, you must control air intake and damper or exhaust. If you don’t achieve a good balance, the result will be a sooty, bitter tasting and smelling food outcome. How do you know if your crossing into risky and poor outcome territory? By the color of the smoke. A poorly balanced combustion of wood will produce a black smoke. Repeat these conditions and you’ll stimulate creosote deposits within your equipment which can reduce the draft needed to ensure the fire gets enough air to optimally combust. Remember, creosote on its own is highly combustible which is why there are many wood stove house fires occurring due to poor maintenance/clean out of these units. Now that your aware that phenolic compounds, specifically guaiacol and syringol are key to tasty, flavorful BBQ foods, let’s talk about these compounds in specific hardwoods. Interestingly, Beech wood is highly prized and used in Europe for smoking particularly in meat processing facilities. This is no surprise to me since Beechwood has one of the highest percentages of guaiacol when at a high heat level (distilling). Know that the phenolic compounds present in all wood distill at variant percentage levels and usually require a combustion temperature of nearly 400°F to peak. Yet another reason why you want to keep a balance to your fire so combustion is optimal. Thus the resulting flavors and aromas are pleasant. -JUST BECAUSE YOUR SMOKING (FOOD THAT IS!) DOESN’T MAKE IT ALL BAD!